Gateway to Wales Golf held their inaugural Autumn Golf Festival over the last weekend of September attracting over 130 entries to the three day event held at Padeswood & Buckley, Mold and Old Padeswood Golf Clubs. The event supported by North Wales Tourism and Flintshire County Council Leisure & Tourism attracted golfers from all over the Midlands, North of England and as far afield as Belgium. “ As a voluntary group representing Padeswood & Buckley, Mold, Old Padeswood, Hawarden, Northop and Holywell Golf Clubs we have been working on this event for 12 months, we have been delighted with the response, 90% of the entries where visitors to the county who stayed locally providing a boost to local tourism” commented John Green of Gateway to Wales Golf. “We would particularly like to thank all those members of each of the golf clubs involved who worked so hard on the day to demonstrate what welcome hospitality our visitors to Flintshire can enjoy”. The three day aggregate prize of £150 and the title “The Leader Gateway to Wales 4BBB Champions 2018” sponsored by NewsQuest was won by James Davis & Paul Gerrard from Huyton & Prescott with 128 points. James & Paul scored 40 points at Padeswood & Buckley, 47 points at Mold and 41 points at Old Padeswood. Winners on the individual days were Padeswood & Buckley, Mark James & Keith Parsons 43points, second Steve Watson & Tom Stanley 43 points and third Michael & Gill Ward with 43 points. Winners at Mold were James Davis & Paul Gerrard with 47 points, second Ted & Rita Graham with 45 points and third Terry Lawson & Tony Hill with 45 points. 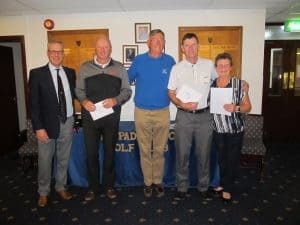 Winners at Old Padeswood were Mike Johnson & Andrew Ainsworth with 46 points, second David Smith & Suzanne Horner with 46 points and third Jan Kelly and Joan Thompson also with 46 points.